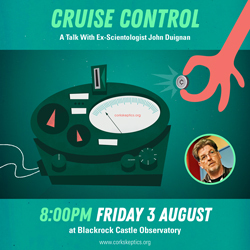 West Cork Skeptics return to DeBarra’s Folk Club, Clonakilty this month to discuss a current issue from the perspective of scientific skepticism. This month’s presentation ‘The Baloney Detection Kit’ by Colm Ryan. In a wide-ranging talk, Colm explores the world of strange beliefs and discusses some ways to distinguish between good and bad ideas. The meeting takes place this Wednesday, October 17th, at 8pm.